Glow of a germicidal lamp excited by a high voltage probe. A germicidal lamp is a special type of lamp which produces ultraviolet (UVC) light. This short-wave ultraviolet light disrupts DNA base pairing causing pyrimidine dimers formation and leads to the inactivation of bacteria, viruses, and protozoa. It can also be used to produce ozone for water disinfection. Low-pressure lamps are very similar to a fluorescent lamp, with a wavelength of 253.7 nm (1182.5 THz). The most common form of germicidal lamp looks similar to an ordinary fluorescent lamp but the tube contains no fluorescent phosphor. In addition, rather than being made of ordinary borosilicate glass, the tube is made of fused quartz. These two changes combine to allow the 253.7 nm ultraviolet light produced by the mercury arc to pass out of the lamp unmodified (whereas, in common fluorescent lamps, it causes the phosphor to fluoresce, producing visible light). Germicidal lamps still produce a small amount of visible light due to other mercury radiation bands. An older design looks like an incandescent lamp but with the envelope containing a few droplets of mercury. In this design, the incandescent filament heats the mercury, producing a vapor which eventually allows an arc to be struck, short circuiting the incandescent filament. At the last two decades the rapid development is acquired so-called excimer lamps having a number of advantages over the other sources of ultraviolet and even vacuum ultraviolet radiation. 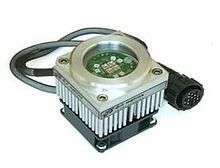 Medium-pressure lamps are much more similar to HID lamps than fluorescent lamps. These lamps radiate a broad-band UV-C radiation, rather than a single line. They are widely used in industrial water treatment, because they are very intense radiation sources. They are as efficient as low-pressure lamps. 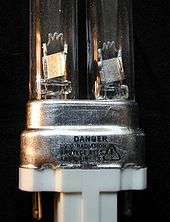 Medium-pressure lamps produce very bright bluish white light. Recent developments in LED technology have led to the commercial availability of UV-C LED sources. UV-C LEDs use semiconductor materials to produce light in a solid-state device. The wavelength of emission is tuneable by adjusting the chemistry of the semiconductor material, giving a selectivity to the emission profile of the LED across, and beyond, the germicidal wavelength band. Advances in understanding and synthesis of the AlGaN materials system led to significant increases in the output power, device lifetime, and efficiency of UV-C LEDs in the early 2010's. As with all gas discharge lamps, all of the styles of germicidal lamps exhibit negative resistance and require the use of an external ballast to regulate the current flow through them. The older lamps that resembled an incandescent lamp were often operated in series with an ordinary 40 W incandescent "appliance" lamp; the incandescent lamp acted as the ballast for the germicidal lamp. Germicidal lamps are used to sterilize workspaces and tools used in biology laboratories and medical facilities. If the quartz envelope transmits wavelengths shorter than 253.7 nm, they can also be used wherever ozone is desired, for example, in the sanitizing systems of hot tubs and aquariums. They are also used by geologists to provoke fluorescence in mineral samples, aiding in their identification. In this application, the light produced by the lamp is usually filtered to remove as much visible light as possible, leaving just the UV light. Germicidal lamps are also used in waste water treatment in order to kill microorganisms. 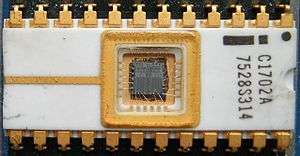 An EPROM. The small quartz window allows UV light to enter during erasure. The light produced by germicidal lamps is also used to erase EPROMs; the ultraviolet photons are sufficiently energetic to allow the electrons trapped on the transistors' floating gates to tunnel through the gate insulation, eventually removing the stored charge that represents binary ones and zeroes. For most purposes, ozone production would be a detrimental side effect of lamp operation. To prevent this, most germicidal lamps are treated to absorb the 185 nm mercury emission line (which is the longest wavelength of mercury light which will ionize oxygen). In some cases (such as water sanitization), ozone production is precisely the point. This requires specialized lamps which do not have the surface treatment. 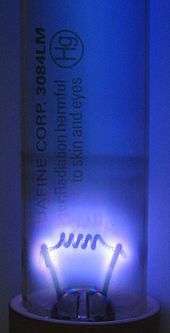 Short-wave UV light is harmful to humans. In addition to causing sunburn and (over time) skin cancer, this light can produce extremely painful inflammation of the cornea of the eye, which may lead to temporary or permanent vision impairment. It can also damage the retina of the eye. For this reason, the light produced by a germicidal lamp must be carefully shielded against both direct viewing and reflections and dispersed light that might be viewed. Wikimedia Commons has media related to Germicidal lamps.